My late friend (K4KXL) and I used to have great fun laughing about the 40 meter "dipole in a bag" kits often sold over here sometimes for as much as $150. He would no doubt be laughing out loud at the price of that QRP antenna! I hope that loop is made of gold tubing ! I want the deluxe model that covers the bands in between the ham bands so I can SWL with it. That model probably costs double because they have to fit all those extra bands inside that little box. There is a sucker born every minute. How much did your version cost you? About the same only in pence I bet. It always amazes me when people pay over a hundred pounds for a wire antenna that is much the same as the one that cost me nothing or maybe under a tenner if I had to go and buy the wire. You can visit oficial site of Alex. 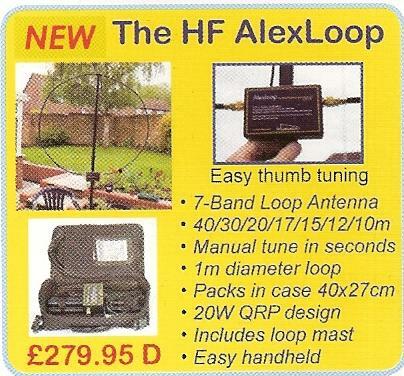 And see a more loop antennas, design and construction. I nearly choked on my lunch seeing that price!